The Abacot Ranger was one of many breeds developed from (or crossed with) Indian Runners. 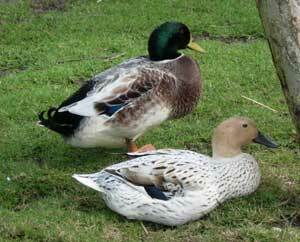 Starting with ‘sports’ from khaki Campbells, themselves originally the products of Runner crosses, Mr Oscar Gray of Abacot Duck Ranch, near Colchester, mated their offspring to a white Indian Runner drake. The eventual results were ‘light drakes of Khaki carriage and type with dark hoods, and white ducks with blue flight bars and fawn or grey hoods’. This development was begun in 1917 and the Wye College Duck Laying Test of 1922-3 indicates a very successful outcome: the breed came top with 935 eggs in the four bird section. Originally called the ‘Hooded Ranger’, this breed almost died out. Imported into Germany via Denmark in 1926, it was ‘stabilised’ as a colour form by H. Lieker, whence it acquired the name ‘Liekers Streifere’(Lieker’s Ranger or Scout). In 1934 it was eventually standardized under the name of Streicber-Ente(Ranger Duck). Later standardized in 1987, the modern Abacot Ranger owes both its sur­vival and written standard to the work done in Germany.